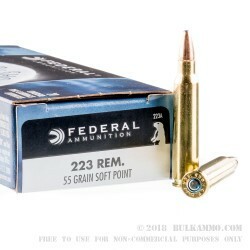 This 223 Rem cartridge by Federal has a muzzle velocity of 3,240 fps, which is exactly to be expected given its projectile’s 55 grain weight. This cartridge sports a soft point bullet, with a copper jacket covering the entirety of its lead core save for its tip. 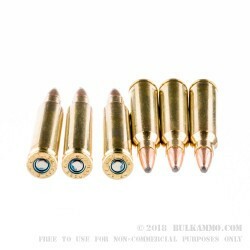 That pointed tip helps to preserve the bullet’s accuracy and penetrating potential, while still allowing the bullet to expand once it has entered your target. 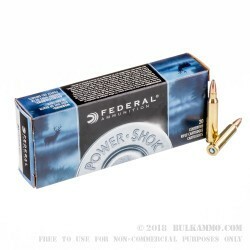 This cartridge is a suitable choice if you’re going after medium to large game -- one shot to the shoulder and its bullet will do the rest of the work. Give it a go in a lever-action rifle for some truly exceptional performance. This round a member of Federal’s Power-Shok line of ammunition, and as such sports a premium primer and reliable propellant. 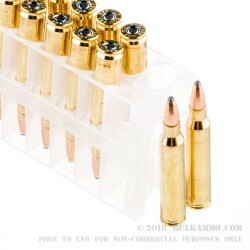 Its non-corrosive Boxer primed sturdy brass casing is fully reloadable as well.